Run for your life! The steps of these children, advance in time. Ordi Calder, Ordilei Caldeira is a self taught fine art photographer for 11 years (2001) his own style is the Conceptual. Influenced by surrealism, psychedelia and Esoterism. Passionate about photography, also photographs Architecture, Landscape, Nature, People, Portrait and Travel. In 2011 two of His conceptual work received the "Selected Award FIAP". His poetic photography is best understood through the concept of "underlies" the perception of the real scenes imbued with poetic values ​​and where he can compose their subjective aesthetic. He currently lives in Cabo Frio, Rio de Janeiro coast of place incredible nature. 2010 - Exhibition Intersections in Time. Museum of Old Hill water tank. Cuiaba, Brazil. 2009 - Exhibition "Light spellings, graphic facts" SESC Arsenal, Cuiabá. This entry was posted on Saturday, May 19th, 2012 at 10:51 am. 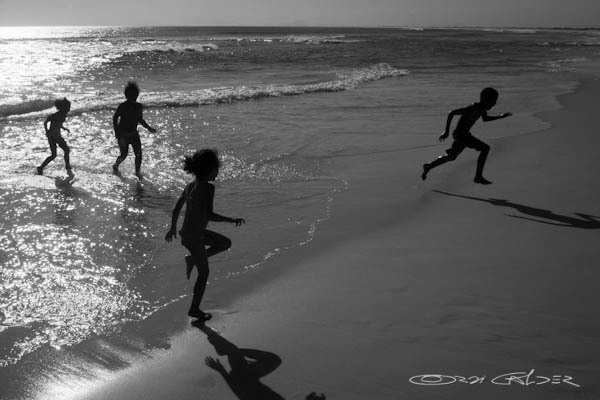 It is filed under Fine Art, New Images and tagged with arraial do cabo, b&w, beach photograph, boy running, Brazil, brazilian beach grande beach, children photograph, children playing at beach, fine art, fine art conceptual photograph, fine art photograph, girl and boy at beach, praia grande, Rio de Janeiro, sea, water. You can follow any responses to this entry through the RSS 2.0 feed.